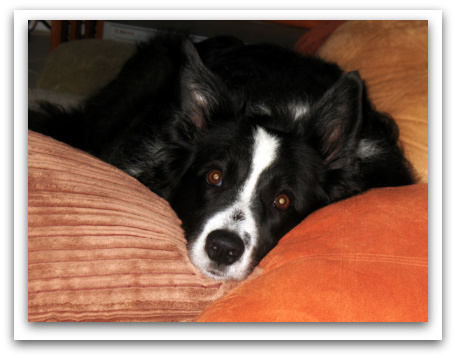 Last week we said goodbye to our almost 15 year old Border Collie, Krusty. My husband got him as a puppy way back in 1996 and I came on the scene 9 years later. Krusty accepted me into the family and we became fast friends. I never really understood “dog people” before, but here I am missing our old friend. When we pray for Oscar at night, we ask Jesus to give him sweet dreams and peaceful rest. I knew I would have to tell him something when Krusty was no longer here, so I told him that he would be going to sleep and he would be with Jesus. Sweet Dreams boy. We already miss you. Oh you just made me cry. What a sweet friend he must have been to all of you. you meant a lot to him, too. things will be different but we will always have pictures like this one to remind us of the good times. I’m so sorry! I choked back tears just reading that. We’ll be praying for the Lords peace and comfort as you learn of life without him. o i am soo sorry … we’ve all been there and it’s the worst feeling … my thoughts and prayers and lots of hugs to you! I’m so sorry, but you gave him a sweet send off with your prayer. This might be the biggest reason I don’t have a pet. Hard goodbyes. Oh, I’m so sorry. That is sad. What a sweet picture. I know he will be missed. tears are streaming down my face into my cereal. so sweet. I’m glad I got to meet that sweet thing a few weeks ago. Oh I am sooo sorry! Pets are like our children, and my heart breaks for you. Nothing can match the companionship of a good dog. Krust was a good dog! I’m a dog person, cat person, and any other pet kind of person. I understand the special bonds. Years after some of our pets have passed, I still miss them deeply. Sympathies to you and your family. Sometimes I pull into the driveway after work and at that moment remember he’s not with us anymore…like I haven’t thought about him all day and then for a split second, I think he’s there. His favorite purple ball is still in the front yard. Coming up on 4 weeks since we said goodbye and reading this post and the comments still chokes me up. I find that anytime I think of him, I get sad. Looking forward to the day I can remember the good times and be happy again.